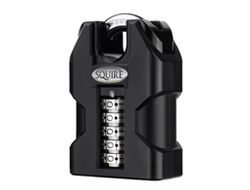 This is a relatively new lock on the market so we haven't had much time to test it. However, it does use a similar mechanism to that of the CP Range of combination padlocks which have proved to be both reliable and popular over the years. We also have the open shackle version of this lock if you need more clearance to fit on a hasp or bolt. 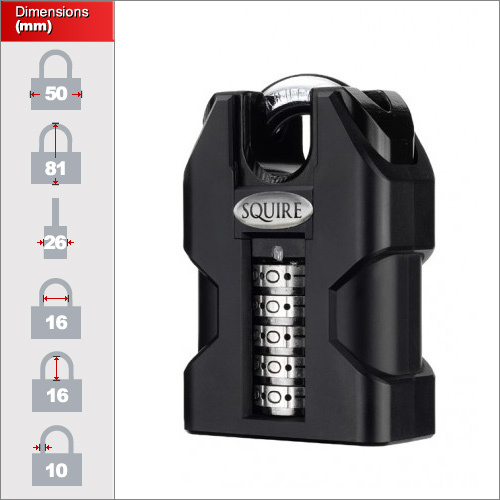 This lock is a closed shackle design and has an especially tight fit for chains. The low clearances between the shackles means it will be very tricky to fit to anything other than a chain. However, when fitted it does mean that there will be very little room to maneuver for someone trying to cut or bolt cut the padlock. Note that will will not fit on chains with links larger than 14mm and it will need a chain with one loop larger on its end so that it can be threaded, and then only one link attached to the lock. You can see these on steel chains review video. It uses a 5 wheel design giving up to 100,000 possible combinations so no thief will be able to work through the codes regardless of the amount of time they have. It has a 10mm hardened shackle which is in fact 1mm less than that of the equivalent ABUS model but we doubt that will be a huge different in terms of attack strength. It is coated in a weather resistant phoretic paint, similar to that used on the ABUS Granit Locks which keep them surprisingly weatherproof. However, we certainly wouldn't advise using this in a salt water environment as hardened steel will rust over time, paint or no paint. The lock is resettable to your own code and instructions are provided with the lock. One important thing to note is that this lock does not come with a security reset key like the ABUS models. It uses a small spike (provided) to turn the numbers once in the reset mode. However, although very difficult to reset without this tool, in our opinion this will not prevent someone changing the code once in the open position if they were adamant. This is worth baring in mind if the lock is on a communal gate and you must ensure that people who have access don't maliciously change the code without you knowing. If this is necessary then you may consider the Shield C50 or the ABUS 190 Series.